Peachy Tan tennis apparel is the brain-child of Priscilla (Peachy) Lopez-Ewaldz, a recreational tennis aficionado. Finding tennis styles at the time too traditional, Priscilla began designing tennis clothing in 2001. She paired her love for tennis with her passion for fashion design to create a line of comfortable and trendy tennis clothing. Priscilla’s fresh approach to comfort and style with attention to detail captured the interest of fellow tennis players, and in 2003, her collection made its debut at the Chicago North Shore tennis clubs. Today Peachy Tan apparel is available online at peachytan.com and in tennis shops and country clubs throughout the United States. In addition to tennis clothing, Peachy Tan offers swim and active wear. Styles are comfortable, contemporary and available for all shapes and sizes, from Petite to XXL. The use of color, pattern, layers, pleating and ruffles makes Peachy Tan apparel distinct, and styles coordinate from one year to the next. New prints are presented each season, and classic pieces are available year round. Peachy Tan introduced a tennis and swim kit appropriately named “In the Bag!” This handy kit comes with a tennis skirt, a tennis dress, a tankini and a pair of swim/tennis shorts – hint: the dress can double for a beach cover-up and be paired with heels for evening wear! Unfortunately it's not sold any more, but we hope for more such ideas from Peachy Tan. Bringing out the girly-girl in the female athlete - Peachy Tan is definitely on-court couture! Check out our favorites from Peachy Tan. Playing tennis is difficult enough, without the proper shoe, it can be a painful experience. After reviewing 5 best men's tennis shoes of 2011, we also looked at all of the tennis shoes that are available today for women and came up with a fantastic list of five of the best 2011 has to offer. Depending on the type of court, and the unique foot of the individual, some shoes will work better than others. 1. Nike Lunar Speed 3 ($59.99-$120). Nike has always produced a high quality shoe. This particular piece of footwear is great for tennis players with a wider foot and a normal arch. With a weight of only about 11 ounces, this shoe will give the support necessary without weighing down the athlete. With lots of support and long-lasting construction, this is a great shoe for speed and agility. No wonder top WTA players like Maria Sharapova and Victoria Azarenka prefer this shoe to others. It is available in light blue, yellow, gray and white making it a perfect fit for any outfit. 2. Adidas Barricade adilibria ($125). This classic tennis shoe is now in its sixth incarnation. It has been around for ten years and has a lot of success behind it. The shoe runs a little large, so it is recommended that women purchase a half size smaller than they usually wear. It fits a normal width foot with a normal arch. Weighing in at a little under 14 ounces, it will not slow down the athlete. However, ladies will need to break in this shoe. The shoe is a favorite of top WTA Adidas ambassadors like Carolina Wozniacki, Andrea Petkovic and Maria Kirilenko, and is available in the variety of colors - from neutral gray to bright blue and pink . It retails for $125 on most of the websites, but you can get it for less on Tennis Express and Holabird Sports . 3. Nike Zoom Breathe 2K11 ($89.99). This new version of last year’s 2k10, is already becoming a classic. The great thing about this shoe is the construction material. The mesh-like fabric allows air circulation and keeps the athlete cooler while wearing it. Ladies want to play tennis, not worry about how hot their feet are. These are produced for women with normal width feet and normal arches. With no break in period, these shoes are ready whenever the athlete is. This shoe is a choice of a great number of athletes including Petra Kvitova, Sabine Lisicki and Venus Williams. And guess what? It's on sale! 4. Asics Gel Resolution 3 ($115). Ever wondered why Lacoste ambassador Samantha Stosur wears Asics footwear? Manufactured with a true athlete in mind, this shoe has a technology behind it. While the shoe is being worn, the memory foam inside molds itself to the wearer’s foot and giving a unique and perfect fit. At about 13 ounces, this tennis shoe is lighter than some of the other Asics models, and are for women with a medium width foot and a normal arch. Find it for less at Tennis Express and Holabird Sports . 5. K-Swiss Speedster Tennis ($84.99) - the choice of Vera Zvonareva. Built to last, this tennis shoe is ready to go with no break in period. The superfoam cushion fits a medium width and normal arch. Not only extremely durable, but this shoe, at about 11 ounces, it is one of the lightest of the tennis shoes on this list. No matter the court surface, this shoe will work fine. Whichever shoe is chosen, always make sure the shoe is the correct size. Improperly fitting tennis shoes can create blisters and sore feet that will wreak havoc with the athlete’s ability to play. Giving the shoes the required break in period before using them in a match is recommended. 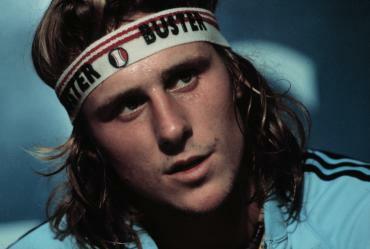 Bjorn Borg. What's He Doing Now? One of the greatest tennis players of all time, Björn Rune Borg was born on June 6, 1956 in Sodertalje, Sweden. During his career, Borg won 11 grand slam championships with a remarkable five straight Wimbledon titles from 1976 through 1980. Borg ranks number four in the list of male tennis players with the most Grand Slam singles titles behind Roger Federer with 16, Pete Sampras with 14 and Roy Emerson who has 12 titles. John McEnroe and Jimmy Connors were the only players to ever defeat Bjorn Borg in a Grand Slam final. Having lost in the final on four occasions, Borg never won the U. S. Open. Even though at the time the Australian Open was a grass-court tournament, he elected to play it only once, in 1974, and lost in the third round. Bjorn Borg adopted a unique playing style. In addition to an unorthodox-at-the-time, double-handed backhand, he hit the ball high from the back of the court sending it down with heavy topspin. This gave his game a great deal of consistency. This, plus a high level of fitness and a calm court demeanor (earning him the nickname “Ice Borg”) contributed to his on-court dominance. Borg participated in only one tournament (in Monte Carlo) in 1982 and lost to Yannick Noah in the quarterfinals. However, at age 26, his announcement in 1983 that he was retiring from tennis came as a shock to the public. Bjorn Borg attempted a comeback on the men’s professional tennis tour in the early 1990s. Using a wooden racquet, he was unsuccessful, failing to win a single match. In 1992, using a Donnay Graphite racquet, he defeated John Lloyd at the Inglewood Forum Tennis Challenge 6–4, 6–3. 2008: ESPN.com challenges former tennis players, analysts and writers to create the ideal, open-era player. 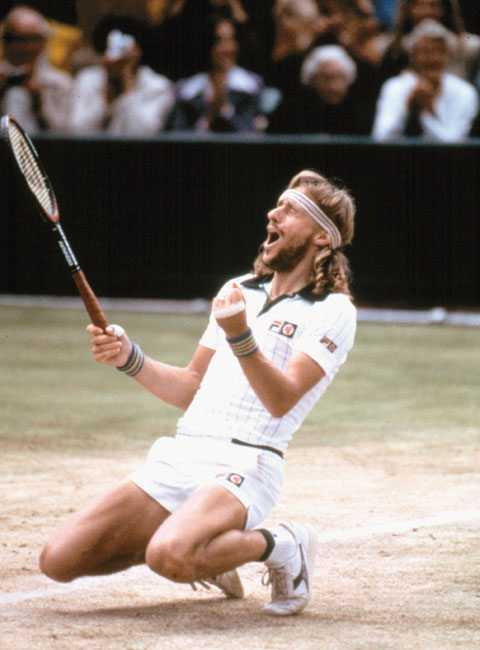 Bjorn Borg is the only player to be considered in four categories: defense, footwork, mental fortitude and intangibles - with his mental game and footwork deemed the best in open era history! 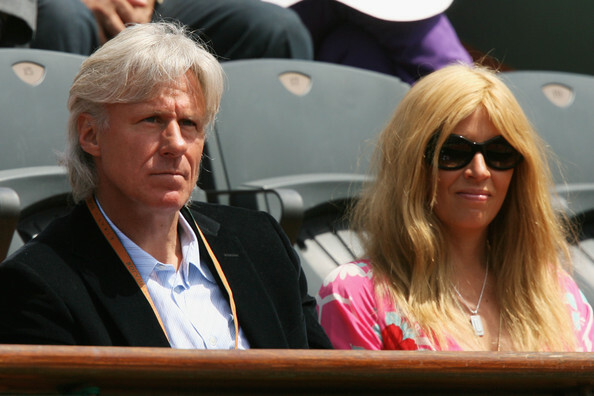 Love Life: Bjorn Borg married Romanian tennis player Marian Simionescu, which ended in divorce. He fathered a child with Swedish model Jannike Bjorling, and he was briefly married to Italian singer, Loredana Berte. He wed his current wife, Patricia Ostfeldt in 2002. Borg owns a number of homes including a penthouse in Monte Carlo and a small island off the coast of Sweden. Currently Borg is the owner of the Björn Borg fashion label, which markets designer underwear, socks, sportswear, swimwear and shoes.